But my righteous one will live by faith. And I take no pleasure in the one who shrinks back” (Hebrews 10:38 NIV). Some people love the challenge of conflict. I’m not one of them. When I feel that nudge to address something I know the other person won’t want to hear, I want to pull a Jonah and run the other way. When my son Brant was in high school, he came home delighted that his teacher had promised to show them a popular Hollywood movie on Shakespeare. Watch a movie instead of doing schoolwork; the whole class was excited. Ironically, I had just seen the DVD. Having counseled women whose husbands had abandoned them for younger, sexier models, I was appalled that it glamorized an adulterous affair as the inspiration of Shakespeare’s genius. The thought of an authority figure (teacher and school) filling impressionable minds with a destructive lie did not sit well. If the college students I worked with were confused by the views presented to them by their professors how much more vulnerable were high school-aged youth? How many of them already lived in households suffering from this damaging mindset? The Bible makes it clear that sin never bears good fruit. In real life, Hollywood’s fictional tales of extra-marital flings play out as horror stories of bitter loss. Jesus said the truth sets us free. But the message and messenger can be misunderstood. I didn’t want to look like a religious, uptight nut, and I didn’t want to put my son in an uncomfortable position. Who wants to be the kid whose mom stopped movie day? I talked with Brant. He agreed that doing right trumped comfort. The teacher said she thought it over and would not show the movie. Yay! Her icy tone said she was not happy. Boo. Shortly afterwards, Brant brought home a well-written paper covered in red ink with a grade of high “C.” Her comments were nit-picky and out of character from how she’d previously graded. A sinking feeling in my stomach told me my son was paying for my call. When speaking truth, even in love, brings backlash we may hesitate to speak up again. We question if it is worth it. Moses, who lived like a prince in Egypt, provides perspective. He regarded disgrace for the sake of Christ as of greater value than the treasures of Egypt, because he was looking ahead to his reward” (Hebrews 11:26 NIV). The world views those who believe the Bible is God’s handbook on life as narrow and out of touch. As a friend once said, it’s popular to search for truth, but narrow to find it. Even if his grade had remained low, it would hardly count as a great loss. But I’ve found the fear of even small slights or being tagged a troublemaker can threaten to intimidate me into silence. 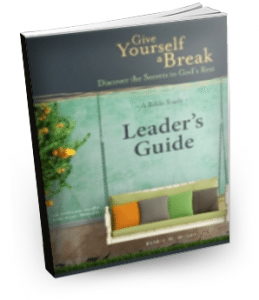 Different situations tempt us to shrink back from obeying God’s prompting. When that happens we need to ask for clarity and courage and take the plunge. Who knows the ripple effect our obedience—or disobedience—will have on us as well as those who watch? But we are not of those who shrink back…” (Hebrews 10:39 NIV). Question: What helps you be brave? 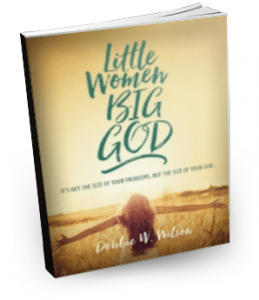 If you would like to join a wonderful group of women who are growing together in Christ for Thursday morning Bible study in Cary, NC please contact me. Our study begins Sept. 13, 2018. We’ll be studying Here I am Lord, Send Someone Else. Oh Debbie I’ve been there! There was an overnight trip all the older elementary children took and mine were the ones who stayed in school because I didn’t feel comfortable with the supervision and there were several movies we opted out of. I know it wasn’t always easy for them to be “different” but I honestly wouldn’t do it any differently now. They’ve all become strong in their beliefs and not afraid to go against the flow. Ann, it is hard at the time. So glad to hear your family was “different” too. 🙂 I believe my children have benefited from us asking that they read a different book or not participate in an activity etc. We are called to shepherd our children’s hearts. That includes protecting what they’re fed in their souls. So good. Thank you. In 2008, John Piper spoke at a True Woman conference about “wimpy women.” It totally inspired me. A reference to that is in this transcript— (https://www.reviveourhearts.com/radio/revive-our-hearts/true-woman-08/). He spoke about the “opposite of a wimpy woman.” …………He talked about “14-year-old Marie Durant who in the 17th century in France was arrested for being a Protestant, put in prison, and told, “You may get out for one phrase: I abjure.” She wrote on the wall of her cell, “I resist,” and stayed there 38 years until she was dead doing just that.” …………. and he gave many other examples. He talked about becoming women of the Word, because wimpy theology makes for wimpy women. He really made me think. 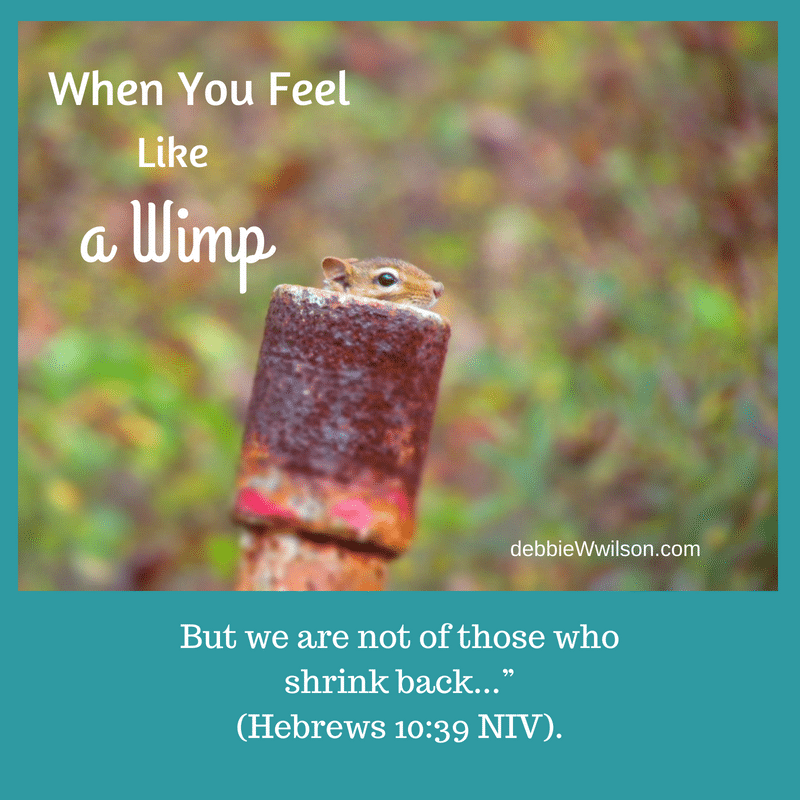 If I am trusting in my own strength and feelings, I can “wimp out,” but if I know the Word and stand on the Word and live the Word, I can be stronger for Christ and holiness than I ever thought possible, because in and of myself, I can get pretty “wimpy.” …….. Anyway, thank you, Debbie, for another great article. Great insight. Dawn, thank you for telling me about Marie Durant. Her story moved me. I pray I will be faithful in whatever circumstance He chooses to put me in. Thanks again! Prayer helps me feel brave. When circumstances bring anxiety, prayer gives me comfort. I am glad you spoke up about the movie. Also, glad his grade was changed to the “A”. Melissa, prayer helps me too. Thanks so much. I’m grateful too. We are always right to do right for righteousness’ sake – the trouble comes when I don’t do it in gracious manner. Satan still gets his way when that happens. Parenting isn’t for sissy’s! “Parenting isn’t for sissy’s!” Amen, Sue! Being gracious is so important. 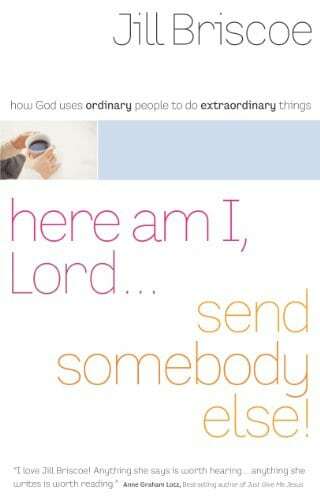 Thankfully God uses our imperfect attempts to obey to help us grow up in Him. I think of Jonah! This article hit home: I am a lot like you in my feelings about conflict. But I’m impressed with the illustration you used of your son and the English class and teacher. Thank you for a great reminder, and prod, to do the right thing, graciously, even when you want to run the other way! Thank you, Jacque. Great to hear from you. I recently commented on a blog where a lady let her daughter review a Harry Potter book, it was along the lines that I was a writer and encouraged imagination and while some Christians may not approve, I felt it was the parent’s responsibility for instilling their beliefs. She agreed. I know there is good and evil in everything and while we want to protect our families, God can do more, all we have to do explain our values, not back down and hide under our bushel, even if it is more comfortable. Rebecca, I agree we need to shepherd our children and not expect others to do that. I believe in teaching them to be thinkers and help them learn discernment and righteousness. You were indeed very brave, Debbie. It is hard for me to be confrontational too, but sometimes we just have to do it anyway. I’m glad you did; who knows the ripple effects you prevented from what the movie might have caused? Thanks, Lisa. As our world moves further away from biblical morals and values it puts us in increasingly uncomfortable places of knowing when to speak and how. I believe they need to know the love of Jesus first, but as a parent or grandparent we have a role to protect our sheep. Love this! Speaking the truth in love is such a challenge, but worth it. God is using that truth in her life in ways you will probably never know this side of heaven. Thank you for sharing! Thank you, Sunshine. I hope so. Love your name by the way! I so often feel like a wimp when it comes to speaking the truth. Inwardly I am cowering and hoping things work out and they don’t rip me to shreds. But stand we must, even we feel like wimps. Theresa, it helps me to read the stories of biblical heroes who also felt like wimps but were strong. Thankfully, feelings are just feelings, and they don’t have to rule us. But I totally get it! Ah yes, it is so hard to stand for what is right in a world in which anything goes, excuses abound, and the blame game thrives. When my son was in high school, he would tell me to be quiet, roll his eyes, and tell me I embarrassed him. I will never forget his voice mail to me after he left home. He thanked me for being strict, for praying for him, and having my Bible study group pray for him. Sometimes I would rather run the other way with Jonah, but peace at any price is not peace. Yvonne, how sweet that your son thanked you. And you are so right. Peace at any price does not bring inner peace. How sad that sometimes our children suffer the consequences when we stand on principle. I’m happy that your son was willing to do the right thing and stand with you and the teacher eventually did the right thing too. Aminata, I think those experiences help us prepare out children for the real world and let them know God is bigger than the people in our lives. Thanks for sharing. I love the fact you used my photo!!! I was walking through some timber in the northern mountains of Pennsylvania while out scouting for deer, and I noticed this pipe sticking out of the ground, which by the way was leftover material from an old pump station of a pipeline, I kept seeing something moving on the top of the pipe and having my camera with me, I figured I could zoom in to see what it was. Well, low and behold this little guy was peering out, I guess keeping watch of my movements, lol. Again, glad you could make use of the photo,. Gene, I thought it was such a great photo and illustrated how we want to hide from the world sometimes. Thanks for making it available!